Such good fortune! InnoWork is relocating to a new home in Mures. The current office served for almost 1 year, but now it’s time to grow(up) in a new place. 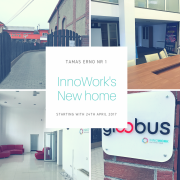 InnoWork team is embarking on a multiyear effort to design a new home with a new partner in crime, the Gloobus team. We will be creating a place to network and to learn, a place to congregate and to connect. We will be building community. In addition, the transition of the space ownership to our partner Gloobus allows the InnoWork to focus on community, doing more, managing costs, driving direct member value. That’s what the new home affords. You will find us there starting with 24th April.